The report includes membership, meetings, publications, and other important information for IGU Commission on Geography for Future Earth: Coupled Human-Earth Systems for Sustainability (IGU-GFE). IGU Commission on Geography of Future Earth: Coupled Human Earth Systems for Sustainability (IGU-GFE) has been formally established in October 2017. IGU-GFE will initially focus on human-land systems and its interfaces with the coast, the ocean and the atmosphere. It aims to promote wider analysis and innovative thinking about global land sustainability through the bridging and synthesis of physical geography, human geography, ecology, hydrology, atmospheric, climate and social sciences. It will provide a platform for communication among geographers globally with the aim of promoting research and innovation in relation to sustainability. The steering committee structure of IGU-GFE is as follows. Dean and Distinguished Professor of Faculty of Geographical Science, Beijing Normal University. Director and Professor of Institute of Land Surface System and Sustainable Development .Faculty of Geographical Science, Beijing Normal University. Director of International Center for Climate and Global Change Research; Solon and Martha Dixon Professor at Auburn University. Associate Professor at Institute of Land Surface System and Sustainable Development, Faculty of Geographical Science, Beijing Normal University. IGU-GFE was formally established in October 2017. As a new commission, IGU-GFE did not organize some meetings at the end of 2017. While, some steering committee members (Prof Hanqin Tian and Prof. Bojie Fu) co-organized 1st CHESS Workshop on Coupled Human-Earth System Solutions for Global Sustainability on August 13-14, 2017. This workshop was held in Auburn University, USA. More than 40 scientists from USA, China and Indian attended this workshop. The chair of IGU-GFE Commission, Prof. Bojie Fu, delivered a keynote speech on Ecosystem services in the changing landscape. Besides, the oral speeches were focusing on providing effective solutions to the most pressing global and regional environmental challenges such as climate change, land use, water quality, soil loss, and poverty via coupled Climate-Human-Earth System pathways and modelling. During the workshop, the scientists agree that it is so important to establish a new commission on Coupled Human Earth Systems for Sustainability. The workshop unveiled the preface of the establishment of the IGU-GFE. The 2018 IGU Regional Conference was held in the Québec City from August 6 to 10, 2018, and IGU-GFE Commission organized the session “Coupled Human-Earth Systems for Sustainability”. Themes of the session include: Fundamentals of Geography for Future Earth, and especially new theories and hypothesis on coupled human-earth systems for sustainability; Open and inclusive platforms for Geospatial Big Data and observations of coupled human-earth systems; Integrated Earth system models to deepen our understanding of complex Earth systems and human dynamics across different scales; Linkages and dynamics among ecological process, services, and human wellbeing; Human Contributions and Responses to global climate/environmental changes and sustainability; Evaluation tools for sustainable development, multi-scale sustainability evaluation, and sustainable scenarios for transformative development pathways. About 17 researchers from different countries got together to have thoughtful discussions about Human-Earth Coupling as well as effects caused by environmental changes. During the session, IGU-GFE steering committee members, who attended the conference, discussed the commission activities and report. The International Workshop of the Global Dryland Ecosystem Programme (Global-DEP) was successfully held on 21-22 October, 2018, in Beijing. The workshop was co-chaired by Prof. FU Bojie (Vice Presidents of IGU) and Prof. Mark Stafford Smith (Vice-Chair of IGU-GFE). More than 30 experts and 90 graduate students jointed this workshop. Prof. Bojie Fu and Dr. Mark Stafford Smith, as co-chairs of Global-DEP Interim Scientific Committee, each delivered keynote presentations that elaborated the aims, main tasks, and implementation framework of Global-DEP and discussed how to enhance dryland ecosystem management from the perspective of Future Earth. In a series of thematic presentations, seventeen speakers from China, the US, Australia, Greece, Senegal, Japan, and Switzerland shared their progress, important results and experiences in drylands research. The presentations considered a range of issues, including ecosystem dynamics and driving mechanisms, ecosystem structure and functions, ecosystem services and human well-being, and ecosystem management and sustainable livelihoods in global drylands. These presentations led to a spirited discussion among the participants concerning the importance of ecosystem management, the complexity of social and ecological systems, and the challenges that must be addressed to achieve sustainable development goals in dryland regions. The establishment of Global-DEP, proposed by Prof. FU Bojie and Prof. Mark Stafford Smith, was formally approved as a key international cooperation project by the International Cooperation Bureau of CAS in August, 2017. Its scientific goal is to provide a platform for global research collaboration on dryland ecosystems and its Science Plan defines key scientific issues and priority areas for future research. The International Workshop on the Human-Earth System Dynamics and Modeling held on 22-23 October 2018 in Beijing is organized and sponsored by Beijing Normal University (BNU) and IGU-GFE commission. There were 17 invited speakers from worldwide attended this workshop. 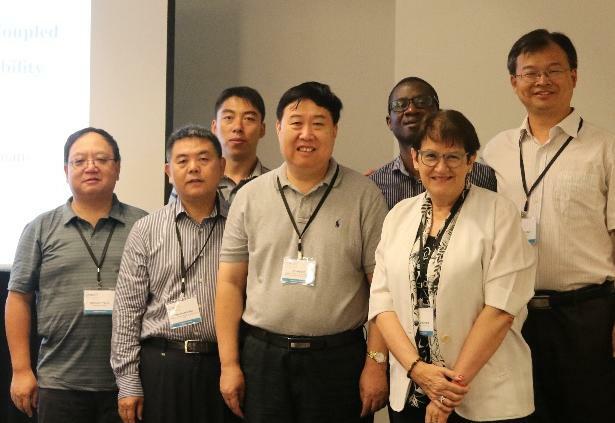 As the organizer of this workshop, scholars from Beijing Normal University introduced research advances in Human-Earth System Dynamics and reiterated goals of this workshop. Scientists from USA, UK and Germany also shared their understanding about interactions between the human system and earth system, compared different approaches (one-way coupling, two-way coupling) with CHESM Modeling, discussed the strengths and weaknesses of existing CHESMs and explored methods of balancing the complexity of CHESM models and the requirements for solving the real world problems while meeting the societal needs. International Symposium on Africa sustainable development in 2019. The Sustainable Development Goals (SDGs), otherwise known as the Global Goals, are calling for action to end poverty, protect the planet and ensure that all people enjoy peace and prosperity. Africa is the world's second largest and second most-populous continent, hosts a large diversity of ethnicities, cultures and languages, and it owns the youngest population amongst all the continents. Africa sustainable development is so important for achieving global SDGs. That’s why IGU-GFE Commission would like to organize an International Workshop on Africa sustainable development in 28-30 August, 2019. It will be hosted in University of Johannesburg, South Africa, and the planned theme will be: Ecosystem Services, Sustainable Development Goals and Global Environmental Change in Africa. The 10th IALE world congress in Milan (ITALY) on 2019, July 1-5. The conference theme is ‘Nature and society facing the Anthropocene: challenges and perspectives for landscape ecology. IGU-GFE Commission will organize a symposium named “Promoting Ecosystem Services for Sustainable Development Goals”. We now have six co-organizers from different countries to distribute information and arrange the schedule of the symposium. The year of 2019 marks the 100 anniversary the establishment of American Geophysical Union. Prof. Qingyun Duan, who is a fellow of AGU and professor of Beijing Normal University, will serve as the liaison of AGU College of Fellows Centennial Subcommittee in Mainland China. To attract scientists in Earth Sciences and encourage them to contribute to sustainability study, IGU-GFE will take this opportunity to join hands with AGU to co-organize series of centennial celebration activities in China. Introduction including an editorial and review paper on main concepts and biophysical processes, as well as its social linkage of global environmental change. Ecosystem structure and function change, presenting global and regional scale assessment of ecosystem structure and function changes and its drivers, ecosystem composition, type, and productivity. Land use and soil conservation, reviewing the results of land use processes, soil erosion and conservation, social processes of land use decision-making and the implications of the changing human-land relationship on land conservation practices. Policy and adaptation measures, synthesis of new understandings of global environment change in changing human-environment relationship and recommendation on policy and adaptation measures. During the session at the 2018 IGU Regional Conference, the new conceptual cascade of “pattern – process – service – sustainability” was discussed in the session, which is a new way to understand the dynamics of coupled human-earth systems, the management policies, and practices for improving sustainability. During the research processes of coupled human-earth systems, researchers should diagnose the response of land use or landscape PATTERN change (human activities) on ecological PROCESSES at multi-scales, and identify the ecosystem SERVICE among various ecosystem functions, and reveal the contribution of ecosystem service on human wellbeing. Human activities such as planning and governance are typical adaptations to regulate the natural components towards SUSTAINABILITY. Fundamental geographical comprehensive theory and methods towards sustainable development. Conjunction and dynamic analysis among ecological processes, eco-system services and human well-being. Multi-scale complexed human-earth coupling models. Human contribution and response to global change and sustainability. Monitoring and Integrative Platforms for Geo-big data. Multi-scale sustainability evaluation methods and pathways for sustainable development. E-ballots for a Secretary General and three Vice Presidents of IGU were conducted in January-February successfully in 2018. Prof. Bojie Fu, the initiator chair of IGU-GFE, was elected as the vice president of the International Geographical Union (IGU) for the period from 2018 to 2022. Prof. Wenwu Zhao was selected as the new Chair of IGU-GFE, Dr. Yanli was selected as the new Secretary and Treasurer of IGU-GFE. We purchased a new domain name and rebuild the IGU-GFE website and the current official domain name is igu-gfe.org. The website of IGU-GFE Commission is a bilingual (English-Chinese) website. It contains seven modules, including Home, About IGU-GFE, IGU-GFE structure, News, Journals, Relative group links, and Downloads. The work on Logo design has finished. Based on the suggestion feedbacks from steering committee members, a final revised version has been chosen as follows. The Logo includes the main theme of the IGU-GFE: sustainability, future earth, and development. The Logo can be download in the IGU-GFE website (http://igu-gfe.org/download/). Spot on with this write-up, I actually think this website wants much more consideration. I’ll in all probability be again to read way more, thanks for that info. Subscribe with access to breaking news services, alerts on the latest research and more. Copyright © 2018 IGU-GFE All Rights Reserved.